These waffles are SO delicious! This recipe is from the book ‘Vegan with a Vengeance’ by Isa Chandra Moskowitz… and this girl knows her way around a vegan kitchen. 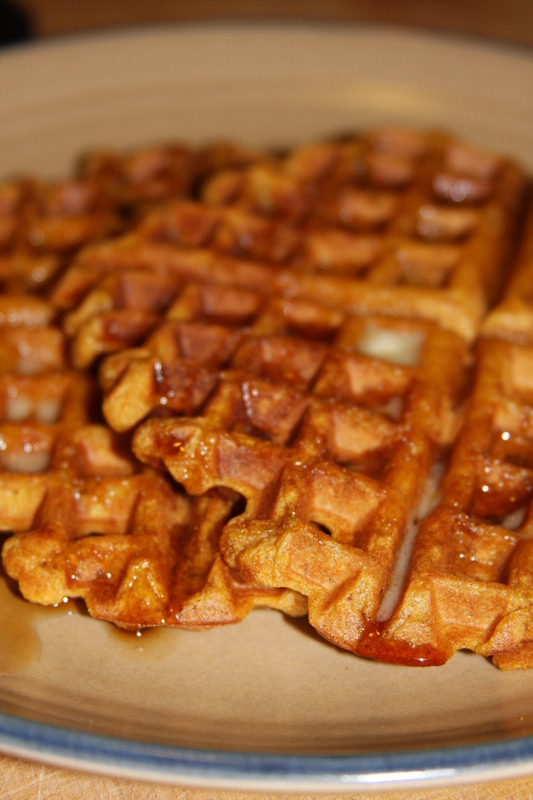 The original recipe (posted below) makes 24 regular waffles or 12-14 Belgian waffles. I halved the recipe this morning in my cuisinart Belgian waffle maker and got 7. I went ahead and put the halved recipe amounts in parenthesis for you on the right! Preheat your waffle maker to manufacturer’s instructions. Sift together the flour, baking powder, salt & spices. In a separate bowl, vigorously whisk together the soy milk, pumpkin, oil, brown sugar & vanilla until well emulsified. Pour the wet ingredients in the dry and mix. Prepare waffles according to the manufacturer’s instructions. ENJOY with real maple syrup!! This entry was posted in baking, breakfast, fall and tagged breakfast, cooking, fall, pumpkin waffles, Vegan, vegan with a vengeance, vegetarian, waffles. Bookmark the permalink. After you gave me this recipe the other day, I made them for dinner (hubs away) and people, they were AWESOME! It was like eating dessert for dinner. Wonder how they freeze? I find that if you cook them lightly the first time and then re-toast them in the toaster oven they turn out great! Thank you for posting! I have a daughter that is allerigic to eggs and breakfast for her can be challenging, especially when she wants what everyone else CAN have! Hey could the same recipe be used for pancakes vs waffles? I don’t have a waffle maker, wasn’t sure if I would need to modify anything. you know Jenny, im not sure how these would translate to a griddle but here is my pumpkin pancake recipe, just for you! ‎1 1/2 cups unbleached flour… 3 Tbsp sugar or sweetener… 1 Tbsp baking powder… 1/2 tsp salt… 1/4 tsp pumpkin pie spice… 1 1/2 cup “milk”… 1/3 canned pumpkin (I used 1/2 cup)… 1 tbsp canola oil —– mix dry. Blend wet. Pour wet into dry and mix until JUST mixed. Griddle on high heat, make silver dollar or slightly bigger pancakes for a happy belly!!!! You are the BEST!! Thank you!